Day one, 8:00am, Wednesday. The Shell Building – I was drawing against the sun, so I was glad I brought sunglasses! 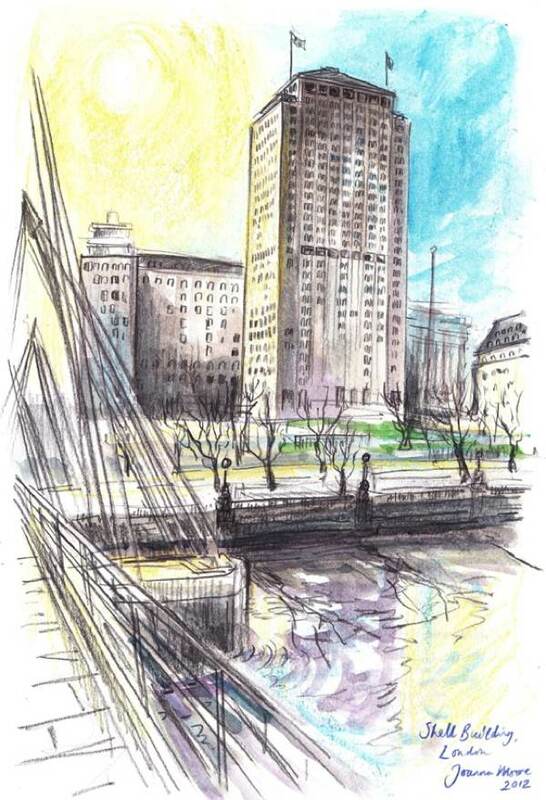 Though a very simple building, the Shell Centre always looks incredibly elegant against the river, a giant monument. Day one, 9:30am, Wednesday. 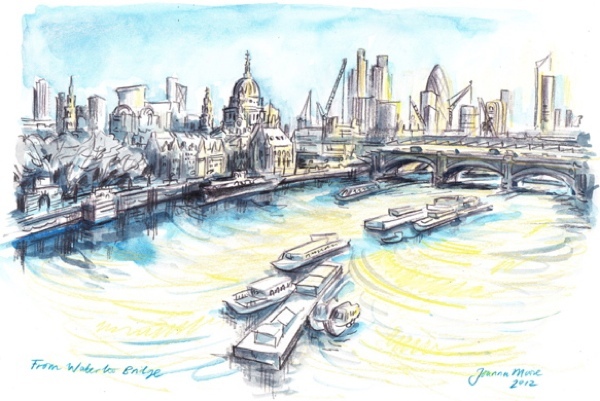 View from Waterloo Bridge – Another bridge, another bright bright drawing. At this time of the day, the City is thrown into extremes of light and shade, so the cityscape is somewhat blurred but I tried to pick out shapes from the shadows and sunlight reflecting on glass. There was so much to take in and the wind was up, blowing my hair all over the place, and I sketched quickly. Day one, 1:00pm, Wednesday. 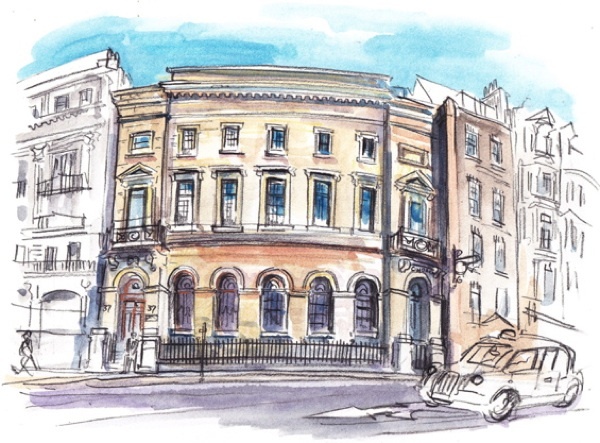 Hoares Bank – A classical building, made tricky by busy traffic and buses constantly stopping in front of me. The sun started to make me light-headed by now, so I sought the shade. Day one, 2:30pm, Wednesday. 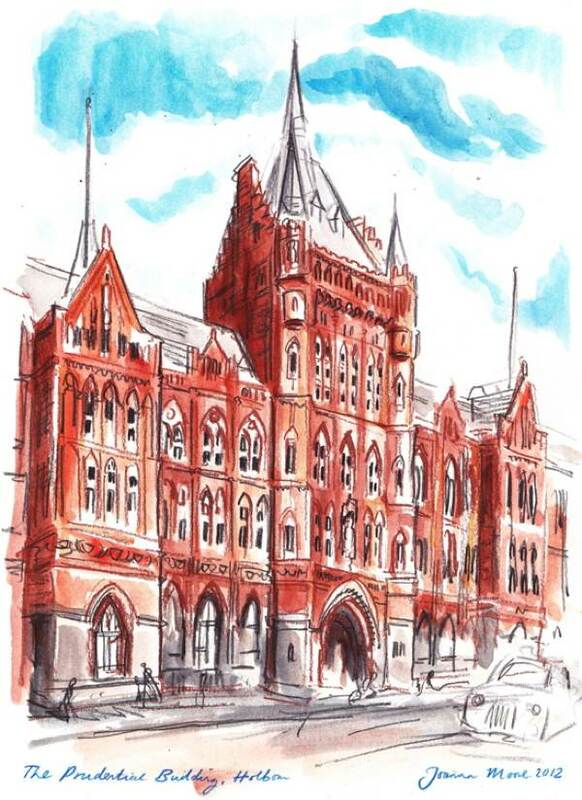 The Prudential Assurance Building – A great Victorian building, and I had never seen it so bright and red. I hid in the shade opposite and considered how funny it was that my mum used to work here before I was born. I was desperate to spend longer here, as the architecture and ornamentation is so over-the-top, but time pushed me on so I could only do my best to sketch in every arch. The afternoon was getting me tired, and even though a large mocha Frappuccino delivered a caffeine and sugar hit, I feared the whipped cream made me even sleepier. Day one, 3:45pm, Wednesday. 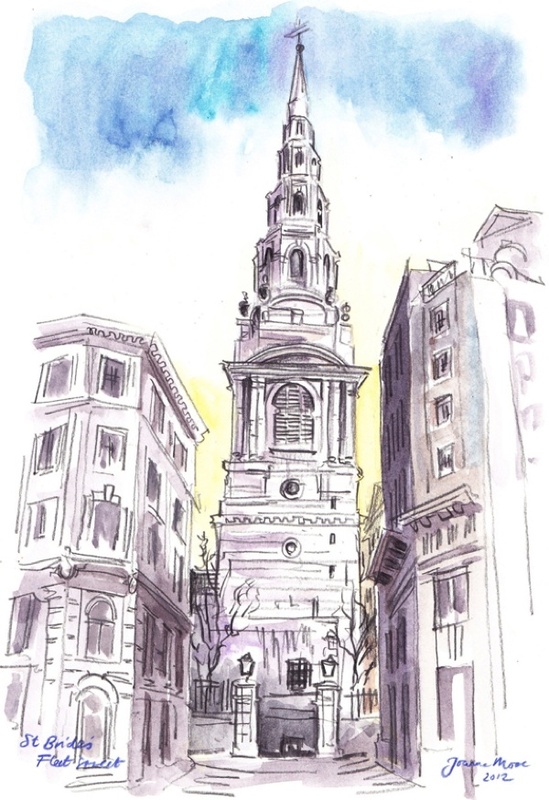 St Brides Church – This wonderful Wren church is neatly slotted into the City fabric and tucked off Fleet St, which makes it tricky to find the best location to draw. So I ended up sitting cross-legged in the middle of Fleet St outside the Express Building and had City workers tripping over me. Once again, the sun was so bright that the shadows were extreme, and London’s Portland stone became shades of purple and blue. Day one, 5:00pm, Wednesday. The Blackfriars Pub – Getting very tired now and after another session on a street corner (literally next to road works for new Blackfriars station) my eyes were dry and my lungs tight. 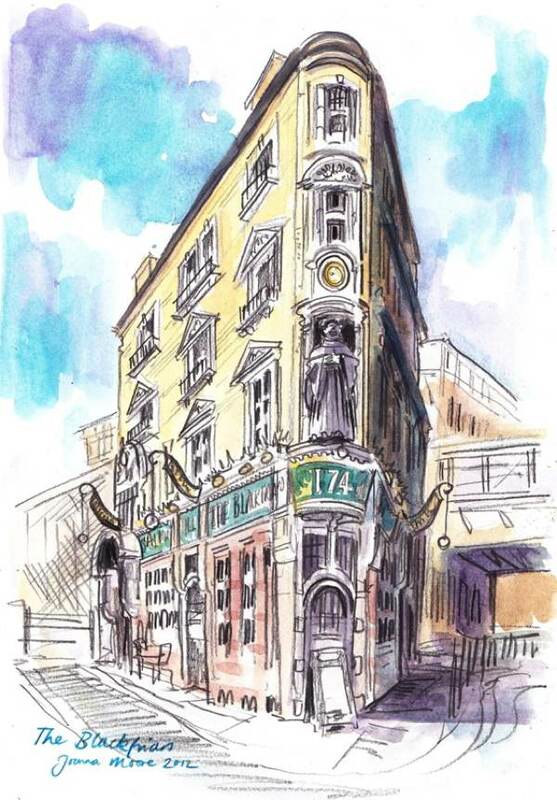 Thankfully, this request just happened to be my favourite pub in London, so I pushed through and rewarded myself with a half of ale. Day one, 6:00pm, Wednesday. 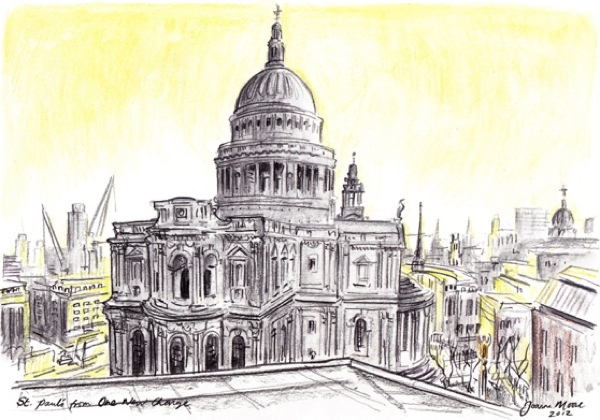 St Paul’s from One New Change – My friend Mandy was so keen to sponsor me for a good cause that she completely forgot to tell me what to draw. Now she has moved to Australia, so I picked her a classic London scene. I have many grumblings about this new shiny shopping centre, but the view from the top is exceptional. Up in the air, my lungs were cleared and I was invigorated by the sharpness of the sun, cutting through streets and creating a halo around the monumental cathedral. Day one, 7:30pm, Wednesday. Southwark Cathedral – Very tired now, and I hastened through the streets and across London Bridge to get to another cathedral before the light is lost. The garden here was shut by now and the market traders all packed up, but it mattered not as this view from the east end is one of my favourites. 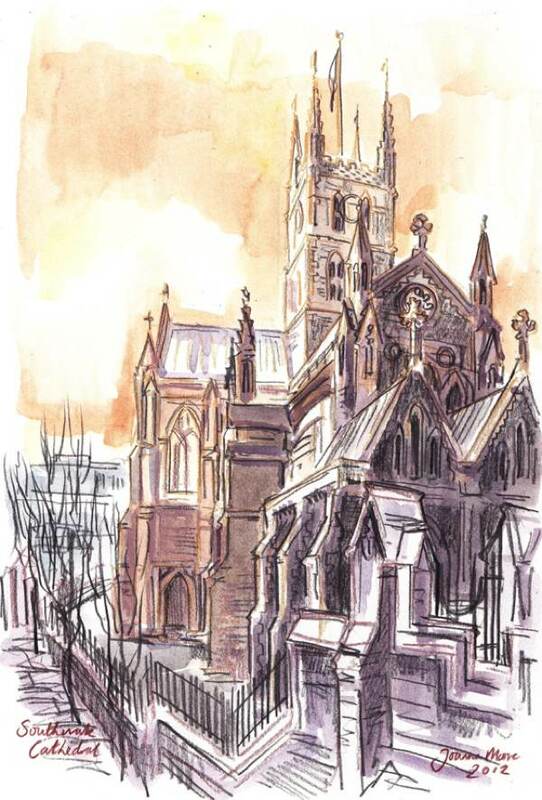 I love being raised so that I can draw both up and down the cathedral. The sunset cast the end of the church into purple shadows, apart from where it streamed through the south transept window. I had to work fast as the light faded minute by minute, which is very disorienting when you are drawing. By 8.30pm it was dark and I could no longer make any judgement, so I took my picture to a street light and in the yellow haze decided it was complete. I packed up and staggered back across the bridge, and eastwards home. Day Two, 8:00am, Thursday Swiss Re Building - Another stunning sky. 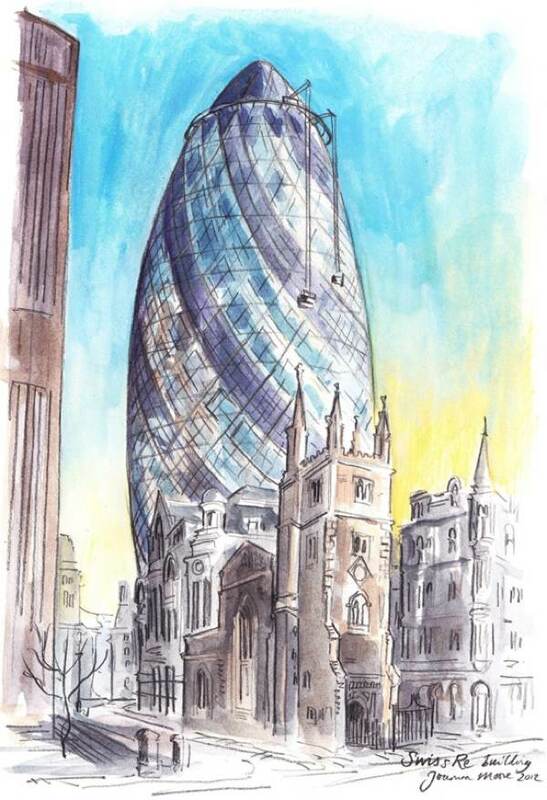 My sponsor Alex had just requested the Gherkin, but since he has been so generous with his commission and I love this view with St Andrew Undershaft, I chose to show the new against the old. The cleaners were out on the Gherkin, mesmerising to watch as, spiderlike, they worked their way up and down the glass on spindly wires. Day two, 11:15am, Thursday. 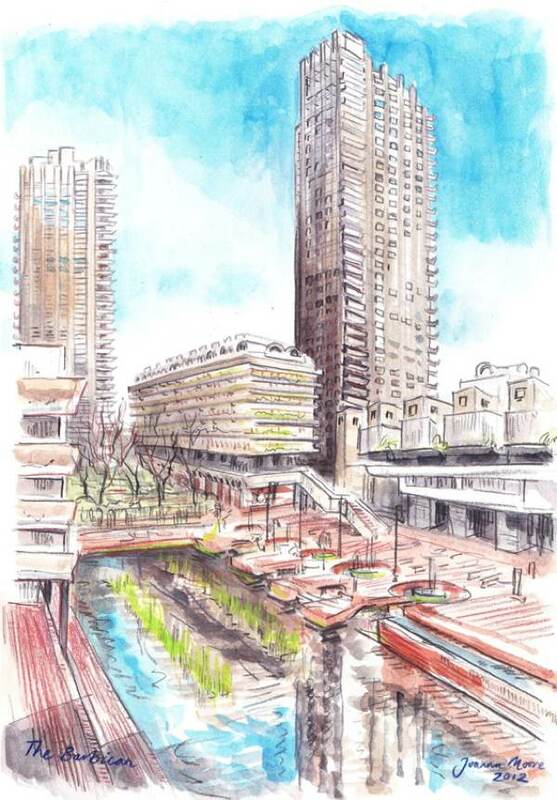 The Barbican – I spend a while getting lost, wandering around the strange beast that is this 1960s development. I love it even though it scares me rigid to draw. It is not a simple modernist building, but something giant and sculptural, a maze, a monument to post-war ambitions and hopes, yet still manages to be a humane, beautifully detailed environment. This drawing took a while to set up, as I fretted over the proportions, but then got absorbed by endless windows and the distinctive balconies. Thankfully, the bright sun was helpful in discerning shapes. But yesterday began to catch up with me, and I found I was already tired. Luckily, I happened to be chanced upon by my friend Louise - a fellow Princes Drawing School student – on her way to London Zoo to draw. A quick chat and the gift of a chocolate biscuit perked me up, and I hopped back on my bike. Day two, 1:30pm Thursday. Wesley Chapel - I stop for lunch at Bunhill Fields, the beautiful graveyard for dissenters opposite the chapel. 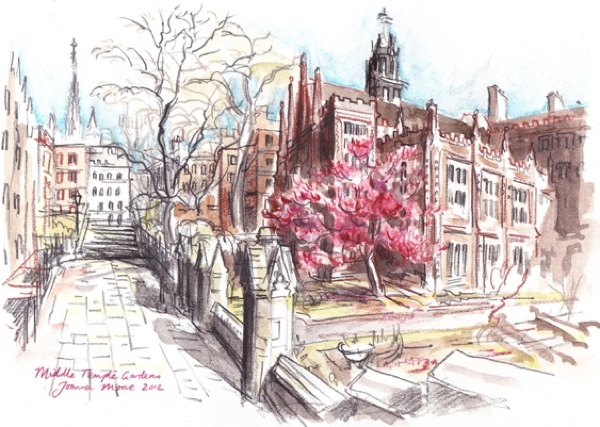 I hid in the shade for a while before I staked out the best place to draw the chapel and found myself back in the sun. I felt I had to include the man himself too, and I like the contrast of his sculpture against the characterful pollarded trees. Afterwards I was met by my parents – in town to see my progress – who rewarded me with a large iced coffee and more whipped cream. By this point, I became dizzy after too much time in the sun! Day two, 5:15pm, Thursday. 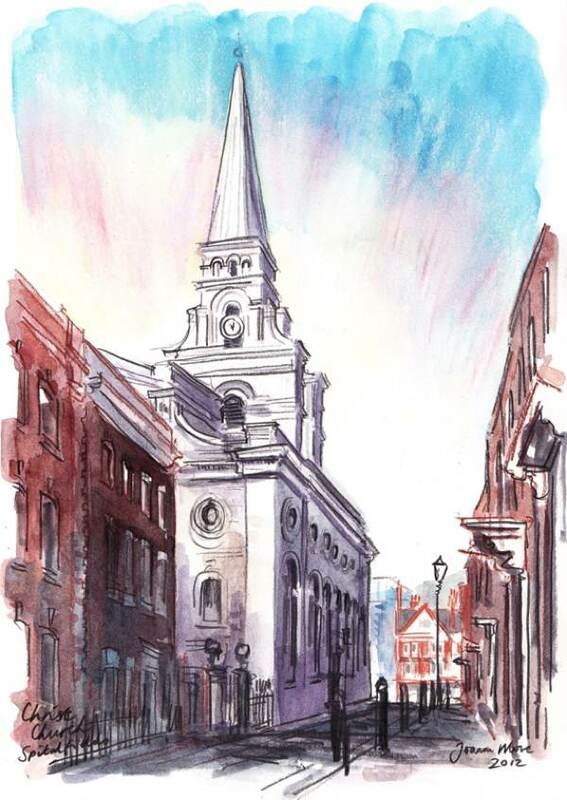 Christ Church, Spitalfields – Another regular feature of my drawings. I knew that Karen who commissioned this picture had a print of one of my drawings with a view from the front, so I decided she should have a side view. This shows the way it appears to shelter the rows of brick houses in the quiet street around it, while the busy Victorian market buildings in the bright sunlight - just a hop and skip across Commercial St – seem to exist in another world. Day two, 7:00pm, Thursday. 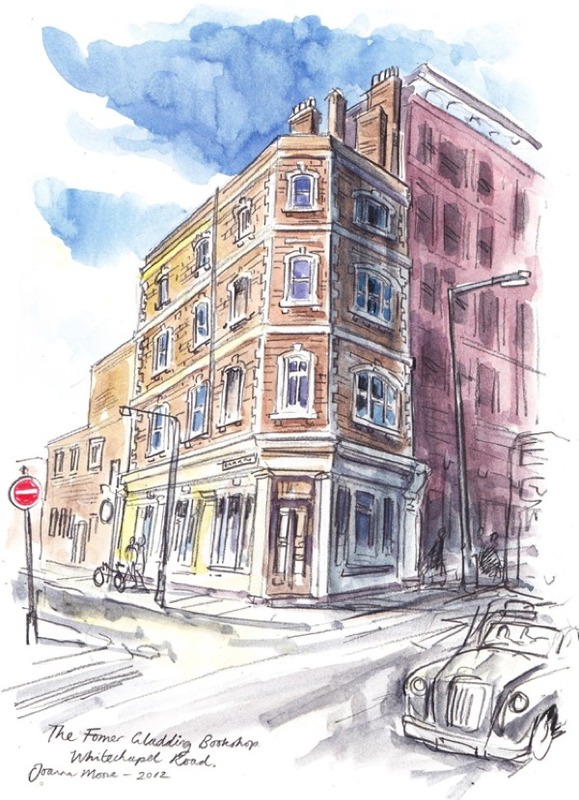 Former Gladding Bookshop, Whitechapel Rd – This was a request from Bob, whose ancestor once ran a bookshop on this busy street. This handsome Victorian building is a lucky survivor in an area where so much was destroyed by bombs. I pushed on with my drawing, driven by the knowledge that this is my last. I finished as the light started to fade and the traffic gathered pace. Across the road, the call to prayer was sounded from the East London Mosque, and I packed up my bike and was called home. These images are so awsome.Made me cry. What an exquisite tour! Thank you to Ms. Moore for the beautiful work and to you gentle author for this blog that delivers such great pleasures. A great visual diary. I particularly enjoy Joanna Moore’s record of the changing light and sky as her days progress. I take my hat off to Joanna, to draw these in such a short space of time, over a broad geographical area…is no mean feat! These are lovely! Thank you for posting them. Wow! What a feast for the eye these are. I felt obliged to instantly devour all your links for this remarkable young woman and her drawings and will follow her with admiration and joy. Many thanks. Absolutely beautiful drawings and the accompanying narrative was perfect. I want to get on a plane ASAP or at least as soon as the Olympics are over. Yes wow! indeed. I especially like The View from Waterloo Bridge. Absolute genius to do all those in 2 days, and how fortunate to have that that wonderful weather we had a few days ago. 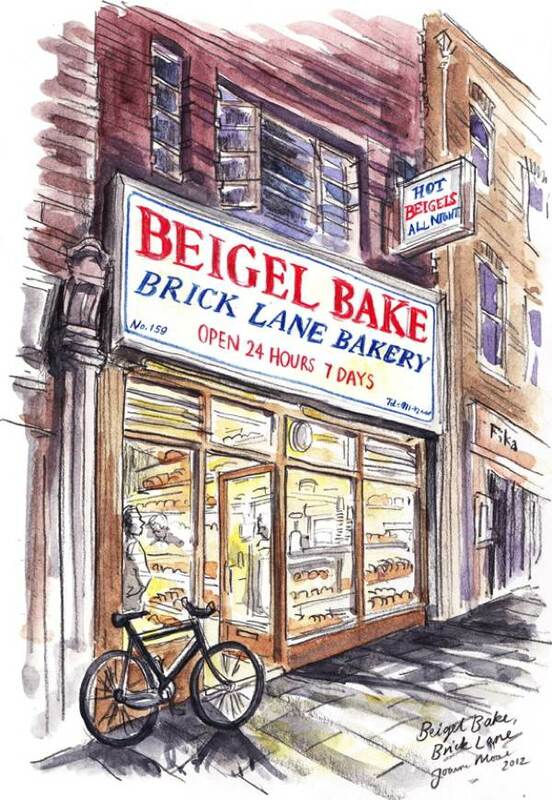 Never stopped missing London. This set of views is great. This was tweeted to me by Hank Dittmar from the Princes Foundation. Glad drawing is being taught somewhere! Barely gets a look-in at art schools any more. And life drawing totally gone. These should be published, used by Boris for tourism literature, etc. etc. fantastic 2 day marathon. Love the appropriate use of colour now and the lighting effects. I can’t match your pace now, but you do have youth on your side! Fantastic article! 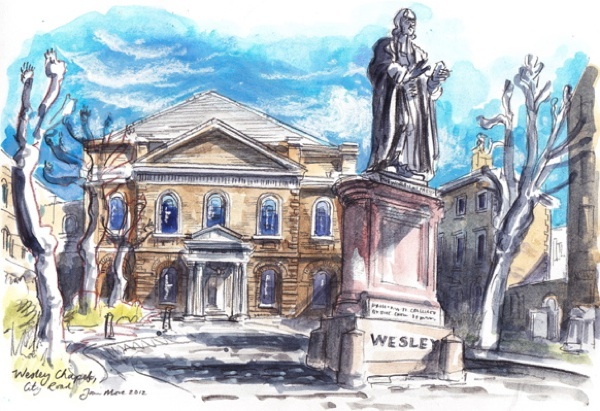 Love the painting of our site at Wesley’s Chapel too! Brilliant.